So China — as in, the People’s Republic of — is really into the Little Mermaid, and not that saccharine Disney cartoon we feed our tumescent American children. The Hans Christian Andersen fairytale is apparently a huge deal in China, so much so that Denmark has been able to establish a strong diplomatic relationship with China almost entirely through the famous bronze Little Mermaid statue in Copenhagen. According to The Daily Beast’s Chantel Tattoli, Copenhagen’s oft-vandalized Little Mermaid statue celebrated its birthday on Friday, an event that Wonderful Copenhagen was furiously live-tweeting in Mandarin. In 2010, Denmark skillfully exploited China’s adoration for all things Hans Christian Andersen by loaning the bronze statue to the World EXPO in Shanghai, a gesture meant, in small part, to reaffirm diplomatic ties (Denmark was the first European country to reach out to China in 1950) that were fractured after Danish Prime Minister Anders Fogh Rasmussen received the Dalai Lama in Copenhagen in 2009. The Danish pavilion, where the mermaid was housed in a blue lagoon, was second in popularity only to that of the Chinese pavilion, and during the course of her March-to-November stay, some 5.5 million people visited the little fish-girl there. “She did such a good job,” former Danish Ambassador to China Christopher Bo Bramsen told me at the time. Indeed, since then, Chinese tourists have been flocking to Copenhagen. 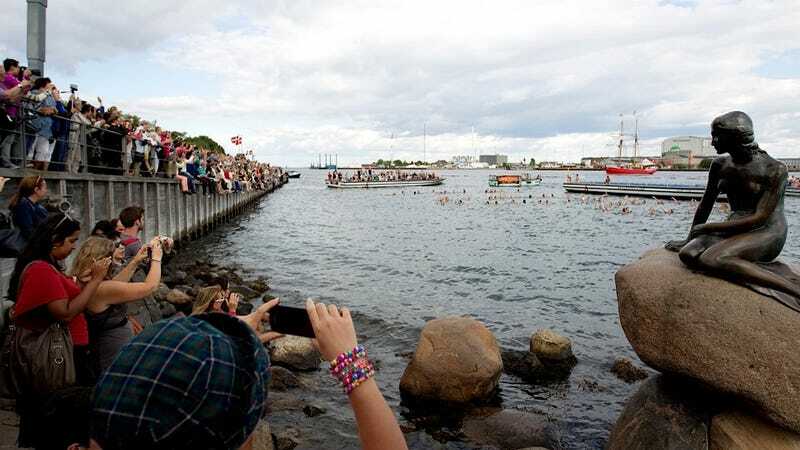 Denmark’s Ministry of Foreign Affairs reports that an unprecedented 80,000 Chinese traveled to the country in 2011, the year after Shanghai’s “year of the mermaid,” and the numbers have been ever record-breaking. In 2012, Scandinavian Airlines inaugurated two daily, direct routes: from Beijing and Shanghai to Copenhagen. Meanwhile, the underappreciated Ursula receives no credit for teaching a spoiled mermaid princess a valuable lesson in being super-careful about signing magical contracts with cephalopod sorceresses.